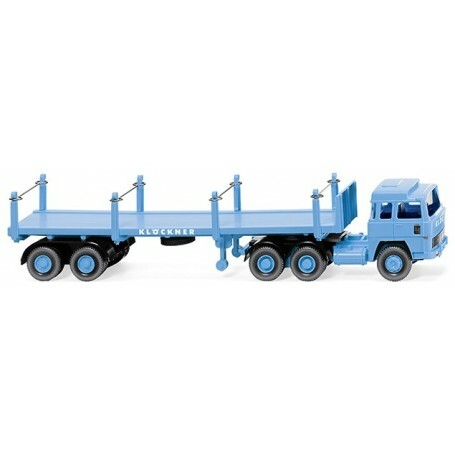  Stanchion trailer truck (Magirus 235 D) "Klöckner"
Stanchion trailer truck (Magirus 235 D) "Klöckner"
Tractor unit: upper and lower part of driver's cab and chassis with cardan part light blue. Front grille black with silver ornamental strip, interior slate grey. Double fenders black, wheel rims light blue. Headlamps painted silver, 'Klöckner' lettering on front in white, side fender black, indicators orange-red. Semi-trailer with light blue platform and the same colour stanchions. Double fenders and retaining plate black, wheel rims light blue. Semi-trailer with white 'Klöckner' lettering on the side.